I came back home from work one day to find a package from Harper Collin’s waiting for me. The fact that I was not expecting this package was enough for me to rip it open to find a book (duh!!!) with a very interesting cover and a much more interesting name. To get the feel of what it was exactly about, I started reading the first few pages by the end of the third page I was kind of sure that it would be a hell of a read. Jugal Mody’s Toke is about Nikhil Parmar, a regular “loser”kind of a guy, who is constantly nagged by his parents about everything, has a mundane job, a not-so-nice manager, no girlfriend, no respect from anyone and basically no life. 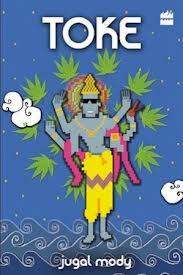 One fine day, he decided to go meet his college buddies Danny and Aman, whose only focus and ambition is life is to get high and joins them in what turns out to be a pretty strange series of event, involving getting all the more high, taking animals , zombies, panic buttons, Japanese Kung fu fighters and Lord Vishnu. I have to appreciate the authors confidence when it comes to narration. In no part of the book you can say that its his first book. The narration is crisp and ensures that you keep on turning the pages. The concept and the story are unconventional and you are left amazed by the time you reach the last page, partly because you can’t help but think what a creative piece of work the book was but also because you keep wondering if everything in the book was just the protagonist’s hallucination. Final verdict….definitely a one time read. Hilarious and smart writing, a very innovative concept, you can relate to everything in the book so if you looking for something to lift your spirits without being too heavy on the brains, pick this book up without giving another thought to it.